So, I challenged my girls to see how many things they could find to get rid of today. I told them I’d pay them $0.25 for everything they got rid of. You children did an amazing job! I stuck to just 7. However once of my friends on facebook did 26, and sold 10 of them in her towns auction website. What is a town auction website? Well really I should have said “facebook page”. Where we live they are pretty popular. They work a lot like Craigs List except they have an auction component to them like eBay. You upload a picture of your item and then list the starting price and the time you are going to end the auction, and then it goes to the highest bidder. I have yet to do it, but I have some friends who make great money reselling their items this way. You meet the winner in the parking lot of Walmart or Target or whatever just as long as it is a public place for safety of both buyer and seller. I am hoping that will make it easier for me to do the challenge and my readers to join me! Either way works great! Thanks for joining us! Well, in April I filled up 22 huge black trash bags of items to donate plus I gave away, sold, recycled or threw out a bunch too. You’d think that would have emptied my house of clutter, but there is more! Sad, isn’t it?! I didn’t have time to go through much today, so I took an easy one and culled 7 backyard toys that didn’t make it through the winter in one piece. Though when I say ‘get rid of’ we donated it to one of our friends who has 5 little ones underfoot. I like the incentive idea though. By the way I suggest maybe giving them away on your local freecycle or similar site before donating to Goodwill or St. Vincent de Paul. There are a lot of people out there right now that can’t even afford places like that so freecycle and like sites are a wonderful way to give to people in the community. I was a member of freecycle for 7 years until last fall, when a no-show person showed up 4 days later and stole some items off my porch that were not for her. The persona admitted to the theft through email. When I forwarded the email, the group moderator told me to “be nice and work it out.” I quit after that. I refuse to be part of a group that condones theft! No shows do happen sadly but I arrange meeting places. It’s never good to have people meet you at your home. My children are a lot better at getting rid of things than I am. So thanks for the reminder to get them to help out! Today I got rid of 45 items! Some magazines I didn’t read are current issues. I thought paired with chocolates and a card, these might be nice Mother’s Day gifts for my children’s teachers. What a great idea! Who doesn’t like a good read and something yummy! I went through the junk drawer in the kichen. I found 4 pairs of sunglasses, paper apples we never used, broken jibitz, and other random items that could go in the trash! I wonder if a $0.25 incentive will be as motivating to my husband. This made me bust up! Perhaps 25 minutes of your time for just him. My 9 yo son and I are doing this challenge together. I’ve asked him to find 14 items each day. He struggled to find 7, I think I can see 200 more items but I’ll let him find those on his own. The 14 items I’m getting rid of today are 2 blackberry holsters, cotton candy machine, a box of old HBA items, 5 pieces of clothing, 5 books. Since the thrift store is so close I am opting for taking these just about daily and dropping them off, out of sight out of mind! I am happy to say that I actually did this today. My things were totally random. 6. About 15 samples of conditioner. Donation bag. 7. All of my many expired coupons. Recycle bin. I am looking forward to tomorrow and getting rid of at least 7 more things! I don’t know if I’ll get this done every day, but for today… I packed up a charming, but unfortunately large for my kitchen cookie jar painted by my grandmother so I can actually send it to my sister who will use it. Also I decided that as much as I’d like to be, I’m not a magazine person, so I included 6 magazines for my mother, who is very much a magazine person. It’s only just turning 1pm here so I’ve got lots of time. 7 things, eh? I can do it! I love that you incented your girls to help. What a great idea! I got rid of 14 things today. And that was before I left for work this morning. I have a feeling I’ll be finding more when I get home and get back to organizing the bookcase I’m working on. 🙂 I love this challenge! Thank you! I emptied out 5 items from my medicine cabinet that were expired or I don’t use anymore. I found 3 pairs of earrings that I can’t wear because of a nickel allergy and I don’t really care for either. They will be going to work to put in the kitchen with a free sign. I also emptied out several boxes of snacks for the recycling container. Are you reading Jen Hatmaker’s book 7? I’m just finishing up a book study on it – and thought it was perspective/life changing! When my girls got home from school, I told all the kids about the challenge. They immediately went and found 6 things between them. I added one more. Three items went in the trash, 2 will go to the thrift store or on Freecycle, and one I’m going to try and sell in a Facebook group I’m in. If it doesn’t sell shortly, off to the thrift store or Freecycle it will go! We’re going to work hard to do this every day. 7 items makes it seem pretty doable :). I told my 6yo son to find 2 things that he can get rid of from his room. After 5 minutes, he came back with a lanyard. After 10 more minutes, he came back with a plastic ball. I suggested he find something bigger, so he looked in his toy area downstairs and came back with- a slightly larger plastic ball. I was hoping to have him find 1 thing each day this month- it’s going to be a LONG month. I’m going to do this with my kids today too… my daughter will have EVERYTHING she owns in a box to get rid of, my son might be able to find one thing… he absolutely HATES giving/selling his things! drives me crazy! I don’t know if it’s just me but one of the linked up sites – The Frugal Ashlock’s comes up as a dangerous site. Thought I’d let others know – just in case it’s not just me. I am still working on my seven. For some reason I tend to think that seven has to be something big, when it could be a thimble. Wow! Great idea to pay them, I will have to try that with my kids. I got rid of 121 items but since I only focused on my junk drawer there were a lot of small items. I don’t think I can get rid of that many items each day. I’m aiming for 7! I threw 8 things away!!!! Will challenge my girls to do the same tonight. Nothing to donte yet, everything came from my bathroom. I got rid of over 50 recipe cards in my recipe box. Never made them, and with picky kids probably never will. Also donated a cookbook I never use. I got rid of 7 things! I love this challenge; it was perfect timing for me, and thank you for hosting. I gladly accept your challenge. This is gonna be great! Trying my best to get this house cleaned up….the sooner I get our bedroom cleaned the sooner we can REPAINT!!!!! We got busy for about an hour today finding things to donate to our church’s garage sale this weekend. I’m not sure how many items it was but I know we got rid of 2 garbage bags of clothes, 2 paper grocery bags of books, a tricycle, 12 fishing poles & a bag of hangers. Felt good!!! I took to Goodwill 10 pairs of new winter socks. I have never wore then for over 5 years. It was time they go. I am also making my house paperless. It is a monumental task. I get rid of more and more everyday and it feels good to see all the paper go. The kids helped me go through the dog toys to get them down to a manageable amount that will fit into the dogs’ boxes. We also found a couple of items that I have no idea how they got into there. Day 1 is done! I think I’ll get my kids involved in the challenge too! Today I got rid of: kid’s clothes, a broken cup, junk mail, a broken storage bin lid, old boots, an empty medicine box and a gum case. Why I had most of these things, I have no idea, lol. Thanks for starting this challenge, I really need it! Looking forward to what else I can get rid of! It is hard to believe the things we keep for no reason. Going through my clothes closet found 10 items so far and I know I will be adding to that pile . Will be donating them to the homeless shelter or to the church rummage sale. Tomorrow I will continue!!!!! I am on a mission! Ok, need to respond and actually do it! will clutter bust today by sun down..
I’ve been decluttering a lot lately so I’m not sure if I’ll be able to do this every day for a month but I gathered 7 things today–a shirt, basket, puzzle, toy, 3 children’s books we never read! Into my yard sale pile they go! I got rid of 9 things — 5 of my husband’s shirts — he has approx 50 shirts and he wears them all! — and 4 broken lawn chairs. Well I hope the lawn chairs will be gone. I put them in my car so my husband can take my car to work tomorrow and throw them in the dumpster at work. 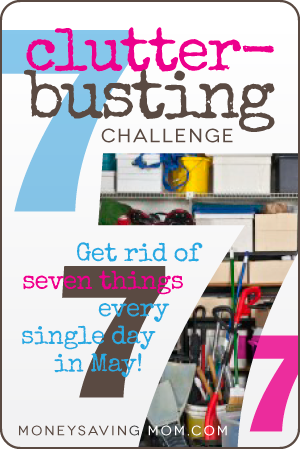 I’m enjoying this challenge and hopefully it will help me clean junk out! I got rid of tons of paper clutter! Also, I was able to get rid of an outgrown car seat, which has been sitting in my front entry for about a month. Yes, that is correct, I have been stepping around the car seat everyday for a month! Phew, glad it’s gone. My son & I cleared out a lot – some for garage sale & some in trash. A drop in the bucket! More tomorrow! After getting rid of 20 items a day during the month of February I had a hard time finding even 7 today. Somehow I managed though and I am going to try and make a plan of action for the rest of the month so I am not wandering so aimlessly looking for items. That’s a really good problem to have; I’m proud of you! Got rid of leftovers in the fridge and some paper work last night as it was garbage night so I am counting that for todays 7. What a great “small amount each day” idea. So much less daunting than “go through your whole house and get rid of everything you don’t need”. 😉 I find bite-sized pieces to be so much more manageable than tackling a huge project at once! 2 old phones, cell phone case, book, model motorcycle, picture frame, long handle dust pan, shredded stack of papers. Love this challenge! With our first baby due in July we really need to purge! We really need to find the space for all the baby stuff coming in :/ I guess it will be less of a de-clutter and more of a baby re-clutter haha! Donated a box of clothes, not sure how many items, to an organization that sets up formerly homeless families in apartments. Tomorrow: Return to Kohls items that still have price tags on them. I finally, FINALLY, took care of our plastic and paper recycling piles. I dropped off about eight bags of plastic and three boxes of paper at the recycling center. My laundry room looks so much better. I have literally pulled hundreds of items from my house over the last 6 months for a garage sale in June, but am not done yet so this will help me add to my massive pile. Found 4 pair of hubby’s work shoes he never wears, glasses case, video game and bracelet!! My kids would probably get rid of everything for 25 cents. Should I just let them? Advice? I heard this story from my dad, he said he once had my brothers (I was older) make a pile of old toys, they didn’t want to give them up, but he took them to a boys home he knew of and asked permission to let them see the kids in the home get the toys. By the time they got home, they were wanting to give those kids their new toys. Or so the story goes! This isn’t exactly doable now days, but maybe finding a way to show the kids that others could really really use or appreciate the things might help? I work at a facility that has children in residential care. I bring in old toys all the time and take donations from others also. Very much appreciated. oh yayyy! I am joining! My local salvation army even does free pickups, but usually only for a decent sized lot of stuff, and I have already started a pile! I got a bag of a dozen or so items from my health and beauty box (aka, random half used stuff I will never again really use) and even got rid of two old cosmetic bags. So excited to see how my house looks by the end of the month! Thank you so much for hosting this challenge, Crystal! I tried to do it fast… went to my closet… thought I would whip out 7 things fast…. I was too attached… ended up with a couple of pieces of clothing… and some gift bags…. I will be better tomorrow!! I did most of it, but my kids helped a little bit too. We are getting ready for a garage sale the third weekend of this month so we did the kid’s rooms today. We came up with a large tote full of stuff to sell. We also had about 7 small bags of trash to throw away. I feel so much better after just doing their rooms! OK I only had a few minutes today, but I found 7 things: 2 pairs of old jeans, 2 old t-shirts, 2 hats, and a purse. It’s a start! With several birthday parties and weddings coming up, I dug into my wrapping paper bin to prepare gifts. I remembered this month’s clutter challenge. So I took everything out of the bin, threw away crumpled/torn wrap and bags, donated holiday specific wrap I don’t need, and reorganized what remained. I’m not sure how many things I got rid of (it was quite a few! ), but it is now so much easier to find what I need!! 7 books that my daughter has long since outgrown. Bagged up and in the car to go a co-worker who has a toddler. Started a box for Goodwill: 4 canning jars with rings; an old tea set that I don’t like and never use. First thing this morning my husband pulled an old, bent frying pan out from the stove drawer, waved it at me and told me it looked like I needed to throw a few things away. I had to laugh at him as I told him I was doing this challenge. Got rid of the frying pan and many other things from the stove drawer and the cupboard above the stove. Love to see a bit more room in my cupboard! My seven items for today, which I took a picture of and posted on my Facebook. One friend said she wanted to/needed to join in after she saw my post. 1. Broken glass toilet paper holder. 2. Pair of too-small flip-flops. 3. Decorative wooden ball thing. 4. Glass jar that once held some stuff grape leaves. 5. Purple hair shampoo to counter brassy blonde colored hair — at least 12 years old! 7. Old PUR water filtration jug that I no longer use. I needed this challenge. Great information. I cleaned out my master bedroom and got rid of 10+ items. An old bathrobe, computer bag, toy, purse, coat, some shirts, and a couple of knick-knacks to donate, and a shoebox, catalog, and various paper items to recycle. Also, I dusted, vacuumed, and straightened while I went. Day 1, check! I’m a little late to get started on the challenge tonight, but I sold one thing out of our shed earlier this evening (its ‘been there for 3 years unused) and I just quickly gathered up 8 things in just a few minutes! Well I did get rid of things, but not the way I intended. Seems I’ve had a small leak under my kitchen sink for some time and didn’t know it. Never opened the door to that side until last night. There was a pan under there full of yucky water that was overflowing, so the bottom of my cabinet was soaked and everything was gross. Today I cleaned it out and threw stuff away that I never used (obviously since I never looked in that side). Got a fan blowing on it to dry it out and I’ll add some type of mat and maybe store some of my bigger pots there after my husband fixes the sink. I’ve made some natural cleaning supplies that are in a couple of spray bottles, so they don’t take up much room. The bulk supplies are in my pantry/storage room. Cleaned out my spice cabinet last night. Got rid of old stuff that was clumped together. Forgot to keep a tally but I know that both times it was well over 7 items. Tomorrow, the cabinet with all the plastic bowls and lids. If neither have a mate, out they go. This has actually been fun seeing other peoples posts to help motivate me. Thanks. Best of all- a lamp that sparked out and nearly caught my bed on fire; we cut the cord off and then it stood in our garage for months until today when I hauled it to a dumpster! Thanks for the motivation!!!!! This is going to be great! Hi! I’ve been reading this site for months, but this is my first comment & challenge. I am going to be out of my home for 5 days of the month so I will try to make up for it by cleaning out and getting rid of things on the weekends. 2. Dog toys that were torn and ripped and put in the drawers for no apparent reason. 7. 2 miniature bottles of lotion with hardly anything left in them. I finally got rid of the accessories from the two blenders that broke a few months ago. Feels nice to reclaim that cupboard space again! Wow, that’s a lot of stuff! I kept to my 7 things. Every little bit helps! I know this is only the second day but so far I’m really enjoying this challenge. 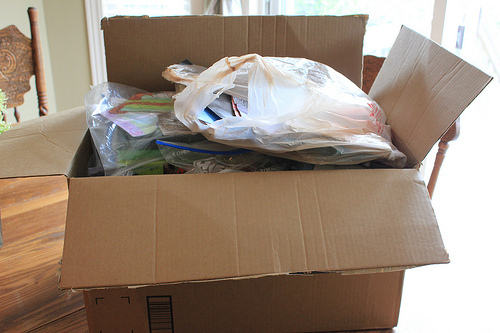 At the same time, once I’d filled a bag with seven things and got rid of it–a few donations, the rest in the trash, I felt a big sense of accomplishment, like I was clearing my way to a more organized, efficient life. I should also note that while I was gathering my seven pieces of clutter for day two, I realized I need to be much more careful about what I bring into my house and thus my life. I was expecting this challenge to be just about cleaning house but it’s already given me perspective. Thanks for launching this Crystal. I’m purged 6 VHS tape (I never did get those abs of steel…) and 1 book. I will be donating all my items at the end of the month to the local Battered Women’s Shelter Thrift Store. They will give me a tax receipt and I will use it for a tax deduction next year! I purged 6 VHS tape (I never did get those abs of steel…) and 1 book. I will be donating all my items at the end of the month to the local Battered Women’s Shelter Thrift Store. They will give me a tax receipt and I will use it for a tax deduction next year! I finally pulled out 2 big boxes of “yard sale items” to donate to a friend who is raising money for an adoption. I’m sure there were many more than 7 items! Now I’m scouring the house for more to give to her for the sale. Thanks for this motivation! I insist that I don’t need ‘things’, yet my house is ridiculously cluttered! We just did a yard sale last week, so I wasn’t sure how much I would find, but I found 7 things pretty quickly. Today, instead of 7 things, I worked in my office for 7 minutes (and then some!) If you count all the papers I recycled, I’m way over 7, so that’s a good thing. I may try doing the quarter thing with my kids this weekend to get rid of items! Thanks for the idea! This challenge is perfect!!! I threw all the old magazines in the recycling box yesterday…way more than 7. Today I cleaned out my pj drawer…9 items. Both days I have cleaned out things I have been thinking about doing for months. It probably would have been a few more months until I got to them, if not for this challenge. THANK YOU!!!! I just recycled some old papers, receipts and a magazine 🙂 If each piece counts, there were definitely more than 7. I’m enjoying this very much! Where is the paragraph about modeling your wardrobe after your maternity one? Thank you so much.